The UnConference doesn't have presentations or speakers. Limited to senior staff at language service companies,* it is more casual and more focused. We emphasize breaking into smaller groups so that each person can be an active part of a conversation, not just a passive member of an audience. All attendees are encouraged to become participants, while facilitators will provide a touch of moderation and structure. This participant-driven meeting allows you to have thought-provoking discussions with some of the brightest minds in the industry--about the issues that matter to you most. *A limited number of registrations are available for industry partners. This is an opportunity to participate in the conversation--not sell products and services. Early-Bird Registration Deadline Is Friday, December 14, 2018. Sign up information will be available soon. Join your ALC colleagues for a whale-watching cruise! 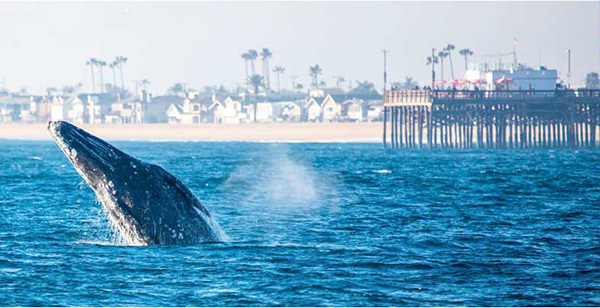 See giant blue whales, finback whales, gray whales and many more in their natural habitat. Tour will depart from Newport Beach at 2:30 pm, and lasts 2-2.5 hours. The UnConference allows you to get up close and personal with the principals of the most influential LSCs shaping the industry today. This informal retreat of about 75 company owners who meet to discuss and share businesses challenges and solutions, is focused on building relationships. Logo on conference signage, promotional emails to drive attendance, and ALC Update (our monthly newsletter). Logo hyperlinked on the UnConference web pages and social sites. Recognition in conference app and on the conference stage during welcome remarks and discussions. Opportunity to make a few remarks to all attendees. Company name on signage, promotional emails to drive attendance and ALC Update (our monthly newsletter). Company name hyperlinked on the UnConference web pages and social sites. Company name on signage, UnConference section of website, promotional emails to drive attendance, ALC Update (our monthly newsletter), and social sites. If you’d like to sponsor an amount not listed, please contact us and we’ll work with you. Exhibit at the Annual Conference and sponsor one or both conferences, and receive a 50% discount on your ALC advertising. See the advertising rates and payment information or contact Mary Connor at (443) 966-3854 or sponsorship@alcus.org. Please reference the Association of Language Companies when calling to make your hotel reservation. Hotel reservations are on a first-come, first-served basis until Friday, December 14, 2018, or until the block has sold out. ALC cannot guarantee the group rate if rooms are still available in the ALC block after Friday, December 14. Steps from the shore in the iconic surf town of Huntington Beach, Paséa is a modern oasis with an unrivaled sense of clean, coastal style and a comfort that you can experience with sand between your toes. John Wayne Airport, Orange County (SNA) is 26 minutes from hotel (11.5 miles). Long Beach Airport (LGB) is 32 minutes from hotel (18 miles). has partnered with ALC and is offering discounted airfare to all attendees. When booking online at https://www.united.com/ual/en/us/flight-search/book-a-flight, use Offer Code: ZFSG703873. If you call United at (800) 426-1122, please remember to provide Agreement Code: 703873 and Z Code: ZFSG. is offering a discount to all ALC attendees. Please call AVIS directly at (800) 331-1600 (refer to AWD # D012156) or reserve your car online. Casual attire is appropriate for the UnConference.